I’ve always thought it would be so wonderful to live like people in Italy, Mexico and Thailand, where one visits the local fresh markets in the morning to see what is being offered by the various food vendors. This traditional, cultural experience influences what one will prepare for that day’s meal by what is available in the market. The only thing fresher than a local or farmers’ market is to take a stroll through your own garden and harvest what is ready to use that day . . . and that’s just what I did yesterday! I just love going out to my vegetable gardens that are right next to my kitchen. All I have to do is walk out the side door with a basket and a pair of clippers and I’m able to return with nature’s freshness to cook with! It’s such a rewarding feeling! And I always, ALWAYS think about my grandparents and great-grandparents who were avid gardeners whenever I’m in the garden! Currently, my bell peppers are growing very well, so I knew I needed to include red, green, and orange bell peppers in a side dish. The herbs are going strong and so something from that garden bed could join in for added flavor. I already had on hand some new baby red potatoes, a red onion, and garlic (purchased from the local farmers’ market). A cookbook or a recipe is not always referred to in my Italian family. The cooks in my family, more often than not, cook and add ingredients as they go. With that said, I poured some olive oil into a large mixing bowl . . . about 2 Tbsp. Into the olive oil went two very huge minced cloves of garlic and I gave it a whirl. Then I cut up the red potatoes into wedges and threw them into the olive oil – garlic mixture, stirring so that they were all evenly covered with oil and garlic. Then I added the chopped peppers and onions. Finally, I tossed in about 3 Tbsp. freshly snipped, and finely chopped rosemary. Sea salt and freshly ground black pepper were sprinkled liberally all over these ingredients. After tossing well, I just placed everything in a medium-sized baking dish and baked them in the oven for about 40 minutes on 375 degrees. To brown the potatoes, the oven was switched to “Broil” for about 5 – 10 more minutes, with a constant eye on things so that they wouldn’t burn and to pull the baking dish out of the oven and toss everything around once to brown everything evenly. A colorful mixture of the fresh veggies before baking in the oven. Golden brown and ready to enjoy! Generously amounts of sea salt and freshly ground black pepper. Place oil and garlic in a large mixing bowl. Toss in all of the ingredients and mix well for everything to be thoroughly covered with oil, garlic, rosemary, salt and pepper. Put everything in a medium baking dish. Bake on 375 degrees for 40 minutes, or until a fork can easily be inserted. Turn oven to “Broil”, with a watchful eye, brown the veggies for about 5 – 10 minutes, stirring once, and then brown for another 5 – 10 minutes. Do not let these burn under the broiler. Fresh is always best, you have captured that in this yummy picture… roasted is much healthier… just beautifully done! Absolutely. Fresh is always best. Love your veggies with the rosemary, one of my favorite herbs. Correct that, probably my most favorite herb. Look at all those beautiful colors! The dish looks beautiful and full of flavor! It’s wonderful that you can experience a farmer’s market right at home. I’m a few hours north of you so it will be a few weeks before I can do something similar. In the meantime, I’ll do my best to keep the weeds at bay! I’m well known at the grocers because I shop daily for produce and fresh bread. These days I am likely to visit a Farmer’s Market 3 x’s a week – so I hear you. 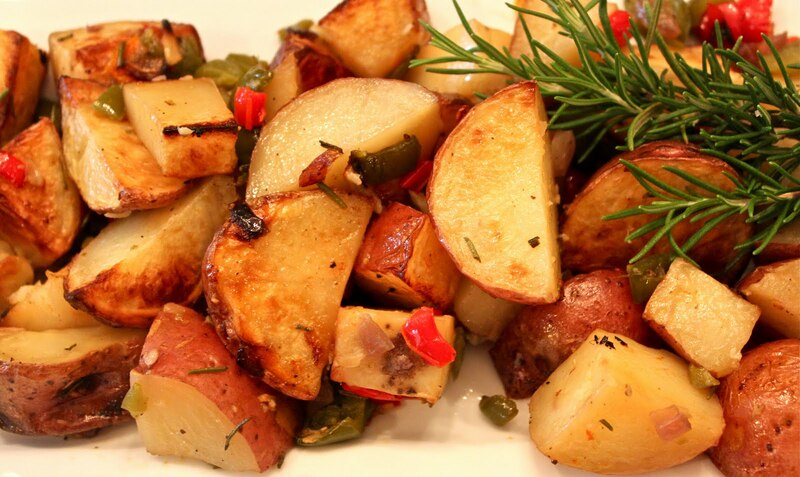 Our peppers won’t appear until late July – but our potatoes are here – so I shall be making this. 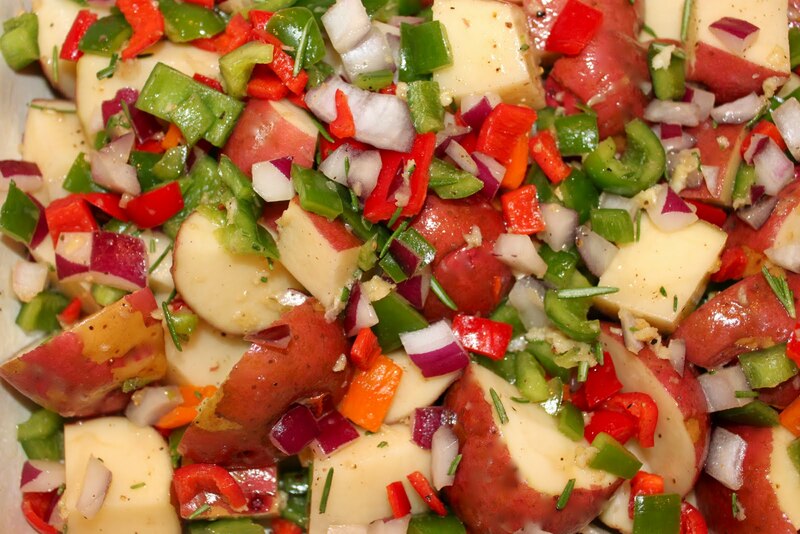 Love fresh peppers and potatoes together – it is so summer and colorful – everything I missed during the long winter. Yummy recipe as always. Looks delicious! These make me really hungery. How yummy! A fantastic side dish! Rosemary and garlic, mmmhhhh perfect. The kind of dish I crave. Ciao! This looks so delicious!!! Fresh is the best especially from your own garden! Spring is so late I can hardly wait for our farm markets to be bursting wuth fresh produce! Just the sort of dish we enjoy but we would leave out the potatoes if eating in the evening. It looks delicious Roz – I especially like the brown you got on the potatoes. I love doing potatoes like these out on the grill!! Yummy!! 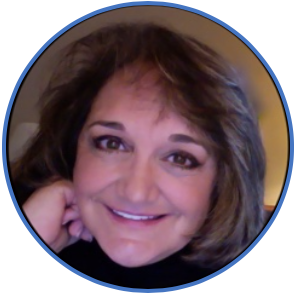 Hi Roz, Your photos are amazing! 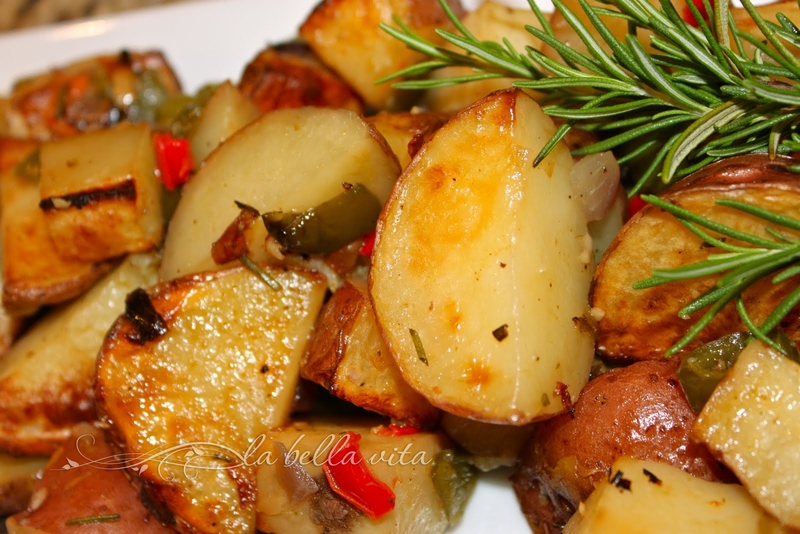 I love potatoes and I can tell you they are great when grilled. Last batch I did was a sweet/white combo! 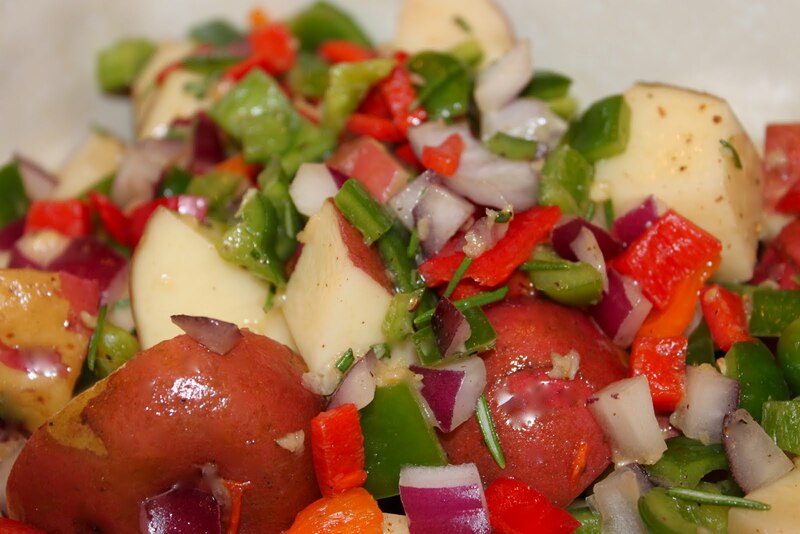 The first photo reminded me… chopped red and green peppers and onions together is aka Sofrito among the Latin community. Looks so good! I wanna try this one soon…. I was actually just talking to my husband yesterday about wanting to make a potato salad that isn’t mayo based. This is right on time! Thank you! I am about to go on summer vacation to the beach and this sounds like just the delicious lunch break I’ll be wanting, thank you!! !